In the 1980 presidential race Reagan vs. Carter, Reagan confronted President Carter on a phrase he invented called the “The Misery Index” which combined the unemployment rate added to the inflation rate. After four years of President Carter, The Misery Index exceeded 20% capturing the poor state of the US economy. We have a new index in the Trump vs. Clinton presidential race, the Clinton Criminality Index. The elements of the Clinton Criminality Index (CCI) includes the establishment of a private server to conduct government business (Unauthorized Server) and 33,000 missing government emails; compromise of countless amounts of classified information on her personal server (Failure to Protect Classified Information); using her position as Secretary of State for personal profit and gain selling access to several US government officials for massive donations to the Clinton Foundation (Pay for Play); failure to secure US embassies and facilities overseas and lying to families about a low-grade video being the cause of death for an attack in Libya that resulted in the death of four Americans including our Ambassador (Benghazi); and last but not least, condescension & deceit directed toward the American public as her normal course of holding office and executing her duties as a public servant (Condescension & Deceit). CCI = Not Fit To Serve!!! I have read many criminal complaints and indictments which allowed law enforcement to effect the arrest of the subject named. Many of those documents did not have a fraction of the probabe cause, substantiated by such a list of facts, as those listed above and elsewhere. 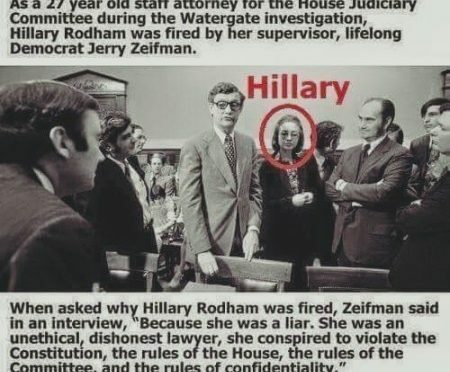 If her name was not Clinton and she were not a Democrat, she would already have been arrested. You nailed it – Trump has a movement; Hillary has the CCI disease – very well communicated!!! “Spot on” synopsis of only the latest chapter of a 30 year volume of doing Satan’s work. That is to say that they are full-on traitors to our American Founders’ Principles. They have betrayed our Constitution and more importantly, they have betrayed God Himself who shed His grace on our nation. They have led many astray with their expertise in practicing “The Seven Deadly Sins” and we can only hope and pray vigorously that our next President will have the strength and courage and good sense to ask God to fill him with His Spirit to lead us back down a righteous path.